Mission Community Family Communion or Worship Service in one of the Parish Churches. Occasionally there are variations to our services. The village magazine provides up to date information on services & events including dates for Messy Church, Book Clubs & Bible Reading Groups which are held throughout the month. A short Service of Holy Communion is held at 9.30am on Tuesday mornings. St Giles Church maintains close links with The Baptist Church, Kilmington and joint Services are held from time to time. The PCC Members are either ex-officio or elected at the AGM and number about 16 including the Deanery Synod Representatives. All Church business is conducted by the PCC including the progress of a Mission Action Plan. Two members of the PCC also serve on the Five Alive Mission Community Council. The KPCC uses the Standing, Fabric, Social and Fund Raising, Worship Committees to assist with Church business. The Pastoral Team comprises about six elected members from the congregation whose role is to help the Vicar with pastoral care when necessary. There is an adult choir under the musical director, Margaret Hurford. New choristers are always required and they should contact Margaret Hurford on 01297 33740. The Music Group is made up of adult and junior instrumentalists. Those interested in joining should contact Rachel Burrough on 01297 631734. Please contact the Vicar for help/advice with any of these matters. More ringers are required for the six bells, and those interested should contact Roger Lovegrove. Two Lay Family Service teams and two Lay Formal Service teams are maintained. Those interested in conducting Bible Readings or Intercessions should contact the Vicar or one of the Church Wardens. Additional people are always required to help with the flower arranging, dusting, brass cleaning, coffee making, catering, clock winding, churchyard maintenance and flag raising. New members of the congregation are always warmly welcomed, and are asked to make themselves known to the Vicar and Church Wardens. Coffee/tea is available at the back of the Church every Friday morning from 10.00 am to Noon. Everyone is welcome to come for a chat. The League of Friends was established in early 2017 to encourage Village residents to volunteer their services to help keep the Parish Churchyard neat and tidy and to help finance the maintenance and equipment costs involved. It is hoped that everyone who has relatives buried in the Churchyard or have had their ashes interred or scattered there will join. The application form is attached with a contact number or can be collected from the back of the Church. 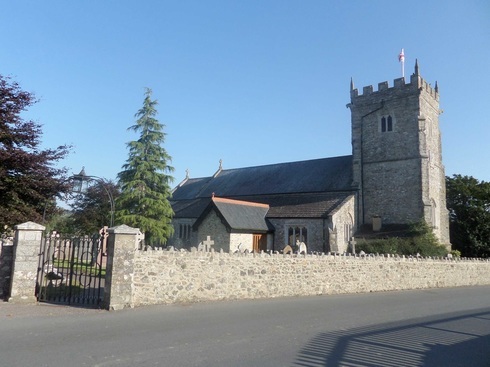 Michael Tyler, a Kilmington resident and retired lawyer who had previously published two books “The Birds of Devon” and “British Oaks – A Concise Guide”, offered to research the history of St Giles’ Church, Kilmington when he was appointed Church Historian in 2015. Commissioned by the Parochial Church Council (PCC), after a year of painstaking study involving frequent visits to establishments with historical records and interviews as well as contributions from many local people, his book was launched at a ceremony in St Giles’ Church on 19 th May 2018. Described by the Bishop of Exeter, the Right Reverend Robert Atwell, as a handsome volume and an interesting historical record which will be a worthy contribution to the Diocesan archives tracing the story of the Church of England in the Exeter Diocese. The Book is now in the British Library and very complimentary remarks have been received from the Devon Archives and Local Studies Service mentioning that the book is beautifully illustrated and contains a wealth of information on the history of the Church. ​The Kilmington PCC is selling the book at £15 and copies can be obtained by contacting the Rev’d Simon Holloway on 01297 35433 or Michael Tyler on 01297 34958. The Book is on display at the back of the Church.